pre-recorded, they (the vocals at least) still were performed live at that moment and not mixed and enhanced in the studio afterwards. 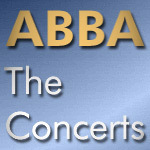 The show’s way of dealing with this was to turn ABBA’s appearance into a joke: The band is cast as the entertainment on the ”Titanic” and during the songs, the camera keeps cutting away to Klein, who mugs ferociously as the ship’s captain, reacting to the water that’s leaking on board. Furthermore, during the second number, the words ”Right now, ABBA is lip-synching. It’s not their fault. The tracks didn’t arrive from Sweden” appear on the screen. The whole thing backfires: You don’t have to like the music to find the show’s clumsy attempt to undercut its own guests infantile and ungracious, especially since Klein’s antics make you want to strangle him. By contrast, Benny, Björn, Agnetha, and Anni-Frid come across as hard-working, eager to please, and just hoping to make it through the evening.